Yesterday, my family had to say goodbye to Bailey, our family dog for 13 years. In the recent months, his health had been declining from cataracts to a collapsed trachea. After losing his ability to walk, Bailey became increasingly frustrated and agitated. He wanted to walk, run, play and do the things he was used to doing. Now, it was time to say goodbye. Via FaceTime, I was blessed to join my family in saying goodbye at the local veterinarian. No doubt, February 7, 2014 was a tough day. Bailey was not only a pet; he was a member of our family. To honor his memory, I want to share some lessons I learned from his life. Bailey did what he was created to do — be a dog! As a part of his nature, Bailey knew instinctively when to come around you without any prompting. I remember the long days of college and seminary when stress levels were beyond human comprehension. As I was working or decompressing, Bailey would walk in my room and sit. He knew I needed his company. And he didn’t have to say a word. His presence was enough. Every holiday or family gathering, Bailey was in the center of the action (hoping to get some food too)! Bailey had the ministry of presence. He was just…there. How we could all learn from this. Sometimes, we feel the insatiable need to say something or do something. Bailey taught me in simple ways to just be there in the moment. Admittedly, there are times when I can take life’s situations way too seriously. Bailey didn’t have time for that! The simple things gave him pleasure…good eats, nice weather, sitting in the sun, playing with his toys, and lapping up lots of water. When I would see Bailey, I would always say, “Man…what a life!” In my joking around, I realized a real life lesson — don’t take yourself so seriously. Enjoy every moment. This life and the time we have is precious. As I type these words, tears come to my eyes. Since my start at Seton Hall University in 2000, Bailey has been a part of every life moment — classes, work, transitions, family deaths, graduations, moving, and my own wedding (we had him wear a doggie tux at home). This Yorkshire terrier had the biggest of hearts in a tiny frame. But, he moved forward after bouts of sickness. Watching in real time was surreal and reminded me that life keeps moving forward. We cannot stop even with our futile attempts to do so. Our family will mourn Bailey’s loss. We will cry and grieve. In the midst of the tears, we thank God for the gift of this small dog who brought large smiles to our faces everyday. Thank you Bailey for being you and in the process, learning from you. Thank you for a great 13 years. We will never forget you! Koo Chung has a long list of titles: recording artist, touring artist, musician, worship leader, songwriter, producer, photographer, husband, friend, and creative partner. He’s gone on to produce five solo albums and tour around the country, collaborating with artists like Derek Webb, Andrew Peterson, and Jars of Clay. Koo’s resume and list of achievements are too numerous to outline here. But, it is his humanity that provides an inside look of how to grieve well, hope in the midst of struggle and remain a dreamer surrounded by despair. 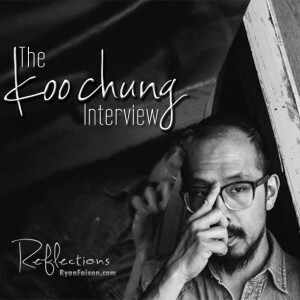 In the first REFlections interview, it is my great honor to present Koo Chung! RF: As a music artist, you have explored various creative directions. What would you consider your most creative moment? Why? Koo: It’s hard to pinpoint one creative moment, but I would have to say that the most creative moments have always happened in the context of collaborating with other musicians/artists. I love teaming up with people who enjoy thinking outside the box and aren’t afraid to spend some time to achieve excellence by exploring different ideas. Most recently, the most rewarding collaborative process was song-writing with my friend Mike Schmid who helped in co-producing my latest album “Brick by Brick”. It definitely sounds different from my previous work, and I can easily say that it’s my favorite out of all the albums I’ve worked on. RF: Koo, you’ve been very transparent about your seven-year hiatus from music, detailing it as a period of “life happened”. What were some lessons that you’ve learned during that season? Koo: The biggest lesson I learned was that you need to know yourself well. Simple as that. The better you know yourself, your boundaries, limits, weaknesses, strengths, and what makes you feel alive – the better you can take care of yourself and be better equipped to maintain meaningful relationships in your life. When all of these are in tact, you’re so much better set up to go out and do what you’re created to do. Not sure why it took 7 years for this to happen for me, but it did. The other half of this is that yes, “life happens”, and things won’t go our way often, and we’ll experience loss & tragedy. To say you need to roll with the punches is more for small inconveniences. When you face life changing scenarios like losing everything you have, or the death of loved ones – the only thing you can do is to try to grieve well. Look the pain right in the eyes, then when the dust settles a bit – process. Thankfully, one of the ways I was able to process was by writing songs. RF: How did you incorporate those lessons in your new music featured on “Brick By Brick”? Koo: I’ve been very candid about my personal life, namely my marriage, in this album. The one thing that might have suffered the most due to not knowing myself well enough, not setting good boundaries, having a stifled music career, & the experiences of loss (loved ones as well as material possessions) was my marriage. The one good thing I can say about loss is that it makes you realize how finite life is, and simply put, I experienced an urgent wake up call to appreciate who and what I have, and to love well with the remaining time I have left on this earth. Many of us experience similar things, but feel incredibly alone because we think we’re the only ones. When this happens, we isolate ourselves and oftentimes, things get even worse because of it. Part of writing “Brick by Brick” was simply because it was one of the best ways I knew how to be introspective about everything I experienced, and because I loved the idea of creating these thoughts in music form – keepsakes, if you will. But the reason I went ahead with recording and releasing this album to the public is because I wanted to encourage people to remove their masks, and risk being vulnerable so we can love and accept each other better when it comes to the dark and gray areas of our lives. The only way I felt I can initiate this was to remove my own mask first. RF: How has your faith in God developed you to the man you are today? Koo: Faith has been the greatest gift, especially in the darkest seasons of my life. When I say gift, I mean it almost literally. It’s not that I have always had a great amount of faith, but it’s that I was able to notice frequently how faithful God has been, and how He has never let go. Therefore, if my life choices, and everyday actions could speak they would probably say, “This is for you God, because I can clearly see Your love and faithfulness in my life. At times it’s as tangible as Your protection and provision, and at others it’s an abstract idea. I want others to experience this, and if I can help reach others with this amazing love, then I’m happy to be Your instrument”. RF: If money or resources were not an issue, what would you endeavor to do right now? Koo: I can honestly say that it wouldn’t look incredibly different from what I’ve done in the past, and what I’m doing now. The only difference would be that some of it would be done on a larger scale. I’ve had recording studios in the past and currently own some recording gear, but with unlimited resources, I’d build an amazing recording / rehearsal studio and offer it as a resource to other artists I believe in (of course I’d use it myself as well, to go in and record whenever I need to). This studio would come with an amazing engineer I have hired full time, because I am not a fan of learning programs like ProTools, and understanding outboard gear. If I’m at all knowledgable about technology and equipment now, it’s only because it was a means to an end in the past. I’d put together a band and would continue touring with my wife, Jinny Kim. The specific purpose or message for the season might change from time to time, but I love the idea of being able to communicate and connect w/ friends and audiences throughout the world especially in the form of music. When I’m not doing this, I’d be back home trying to get better at my craft, practicing, reading, writing, and of course I would always stay involved w/ my local church’s worship ministry. So yeah, not entirely different from what I’ve been doing. RF: What do you consider your greatest success? Why? Koo: Every once in a while when I meet a younger Asian artist/musician for the first time, I am surprised and incredibly honored when they say to me that they have heard of me, and that I have “paved the way” for artists like themselves. When I was in my teens and twenties, there were still not too many of us putting ourselves out there in the music world (here in the US, that is). A large part of why Asians never pursued their dreams of becoming an artist was because they didn’t feel like they could succeed in the US, or that they didn’t have the blessings of their parents who immigrated here and worked hard so that we can have a good education and be “successful”. We are not all wired however, to have the same kind of academic or corporate success. There are many incredibly gifted Asian artists who can impact the world in great ways. I’m relieved to see how things have changed in the past two decades, and thankful to have played some small role in it. RF: There are those who are reading this blog that are at a crossroads. They may be conflicted about how they should proceed on a dream or a goal for the new year. What words of encouragement would you offer them? Koo: Recently I spoke with a friend who said that she intentionally chose not to do something she loved full time because if she did so, it would begin to feel like work and that she wanted to always enjoy what she did. Another friend told me about his experience with an artist he knew that had no backup plan whatsoever, because not doing music was a foreign concept, and not an option. This artist ended up having a hit single on national radio, and continues to do music now. In both examples, their motivations were purely based on how they experienced doing what they loved. Their actions were not determined by a desire for fame or for financial success – and I would say that these two things often hinder our approach to achieving our dreams and goals. Bottom line is, if you love and believe in something – pursue it. Put in your time, practice, make mistakes, put yourself out there – especially if you believe in the message of what it is that you’re sharing. If you’re not at a place where you can do what you love full time, then work – earn money – but don’t be discouraged or think yourself a victim for having to do so. Learn what you can from your current job. If you’re paying attention, there’s always something valuable to learn. I didn’t want to work at Starbucks forever, but when I did, I learned many aspects of management and cultivated important people skills. Continue to prioritize and carve out time to do what you love, and if one day it becomes your livelihood, be thankful and set appropriate boundaries in your life so you continue enjoying what you do. Never forget to prioritize important relationships in your life. Love well, and have fun along the way – life is too short. You are loved for who you are, and not merely what you can do. For more information on Koo, check out www.koochung.com. Click here to buy Koo’s latest album, “Brick By Brick”. ― Rev. Dr. Martin Luther King, Jr. The national Martin Luther King, Jr. holiday prompts almost universal praise for the well-known “I Have A Dream” speech on the steps of the Lincoln Memorial on August 28, 1963. National media outlets play excerpts of Rev. Dr. King masterfully describing the corruption of racial injustice and the potential of racial reconciliation. Dr. King articulated a great dream, but the “I Have A Dream” speech was more than a dream – it was a call to action. Before ascending to the heights of leadership on the international stage, Dr. King was trained in the value of service. Serving the felt needs of people was his top priority. An urgent need that he could not ignore was the racial injustice poisoning the culture in America. He could not stand idly by while discrimination, racism and injustice ran rampant. His devotion to service was not lip service – he made the choice to service with action and devotion. As an MLK Scholar at Seton Hall University, I was reminded of the great call to action that laid at the feet of my generation. Breaking the cycle of entitlement, it was (and still remains) our responsibility to serve and give of ourselves to the betterment of society. When I think of MLK’s life of service – I must ask: What are we willing to give to serve others? What time, talent, treasure and efforts will we give for the sake of others? As we dream for a better life and society, we can start serving where we are to bring about change. Some historians and observers mistakenly limit Dr. King’s influence only to the realm of social justice and racial reconciliation. I would caution you not to make the same error. Dr. King’s cause was greater than seeing racism eradicated. It was extended to the root of the Gospel – love. Unlike the “love” defined by our culture in moments, Dr. King served out of a love defined by the Scriptures – sacrificial giving. His example was in the Savior he preached about. His model was in the sacrifice of Jesus Christ on the cross for the sins of humanity. A young preacher and leader would not make such sacrifices on a whim; the surrendering of his life was in exchange for the agape love he longed to see. Dr. King never claimed to be a perfect, flawless man. Such an arrogant presumption would violate the humanity and brokenness of this influential leader. He recognized his frailties, but did not excuse himself from the hard work of perfecting our union. He was dedicated to the cause of Christ, leading him to unchartered waters and the “fierce urgency of now”. Dr. King demonstrated he would rather face death than live in the man-made world of apathy and despair. The excuses of delay and denial are no longer acceptable. We cannot delay in taking action steps to make a real difference in our communities and neighborhoods. We cannot deny the need to serve others who we know and see need our assistance. In the words of Dr. King: “This is no time for apathy or complacency. This is a time for vigorous and positive action.” Let this vigorous and positive action start in taking a small step to give what you can and when you can. It is my prayer and hope that the words of Dr. King go beyond a dream; it will become a reality for all of us to enjoy. In my junior year of high school, I entered into the world of high school musical theatre. The headlining musical for the year was Sweet Charity and my debut role was the character Daddy Johann Sebastian Brubeck. This dark, mysterious and self-described oracular character demanded a performance equal to the captivating script. Rehearsing lines with my fellow cast mates proved to be an experience I will never forget. I watched in awe how the character came to life in each scene through the music, dance and dialogue with flawless execution. It was quite fascinating how in the course of a play, you can become a whole new character and no one would know who you really are. Once the play was over, I realized how easy it is to pretend you are someone else. Rehearse the lines, mimic the mannerisms, copy the tone and tenor of the voice and there you have it: a new character, a new identity. But, the new character is not the real you. The inner struggles are covered, the dark secrets remain hidden and the personality you want to show becomes visible upon demand. We can say we are adapting or adjusting, but let’s be honest – we are lying! We are lying about who we are. We hide the best of ourselves to avoid risking showing the vulnerable sides of our being. As a result, very few if anyone knows who we are and quite often, that’s how we like it. Who really wants to see who we really are? I’ve got too much baggage and junk. What would be their reaction? Will they still love us? The truth: When you deceive others, you deceive yourself and the unique purpose God created you for. The temptation to present a false self will only lead to moving further and further away from your identity. Rehearsing the lines of someone else’s script for your life requires you to play a fake character. Living out God’s plan for your life requires you to show real character. Today, let’s make the choice to put the scripts away that put us in a box. This choice will take courage. It will take discipline. It will take sacrifice. But, the sacrifice is much greater than forfeiting your God-given identity – any day. Don’t surrender who you were created to be to become what you think others want you to be. 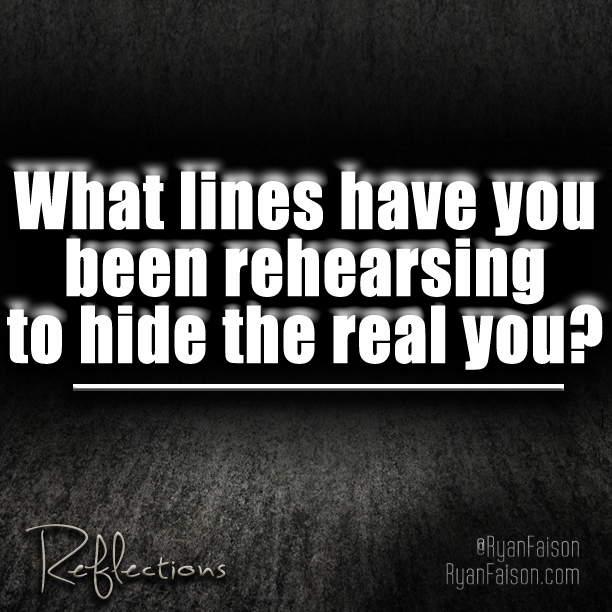 What lines have you been rehearsing to hide the real you? Whether intentionally or unintentionally, the deception can imprison you to be someone you are not. In this year, let’s collectively make the bold choice to be who we are without false pretenses. Let’s open ourselves up to learn, grow and mature. But, for the sake of yourself, those you love and the God who created you – don’t forfeit your identity. But one day, the sound of a ticking clock will not reach my ears. Nowadays, we have electronic devices that give us the convenience of not hearing the second hand and minute hand rotate clockwise. But, when you hear the sound, you realize seconds, minutes, and hours have passed from your life. It can either be frightening (“How much time do I have left?”) or motivating (“What can I do with the timeI have?”). The John Blanchard quote above resonates with me because time is truly a gift from God. He has graced each of us with the same amountof hours in a day to accomplish our purpose. And if our perspective is established in this truth, we would no longer find time to complain about what is not. Rather, we would prepare ourselves for the now and the possibilities ahead. Let’s tell the truth – in some form or fashion, we all have squandered time. We might have spent it doing something or going somewhere and we wonder – “Why did I waste my time doing that?” In this New Year, the question is not how you spend your time, but with the time you have, how are you investing it. Men and women who accomplish great things for God, their community, and for the betterment of society inspire me. Their determination, drive, and discipline are examples of what could be. As the clock ticks, they use their time rather than time using them. They have learned the discipline of managing each hour given and to manage themselves better. You have 86,400 seconds today. How will you invest the gift of time given to you? 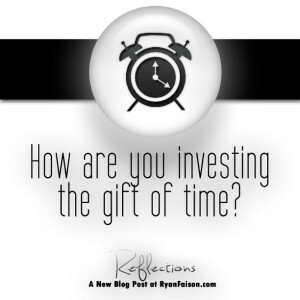 (1) How are you currently investing your time? (2) What changes could you make this year as compared to 2013 as it regards your time management? (3) How often to you invest your time with God to say thank you for the gift He’s given you? (4) How can you show God that you appreciate His gift? 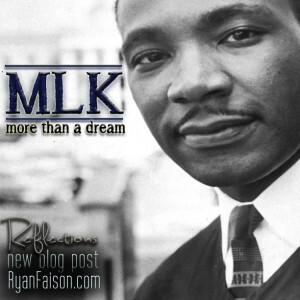 Welcome to the official first blog entry on RyanFaison.com! I’m a husband, son, uncle, brother-in-law, nephew, cousin, and friend. I’m a follower, servant and friend of Jesus Christ. I’m a preacher, teacher, worship leader, and ministry leader. I’m a college and seminary graduate. How we define ourselves shows us what we feel is important to us and what we want others to know. What I shared above is only a fraction of who I am. And if you were to look at your own resume or written self-description, you probably would say the same. We are more than meets the eye! In this blog and through the pages of this website, my simple goal is to humbly help you see you. 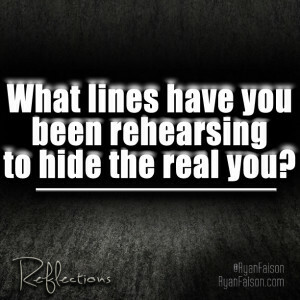 In the stories, questions and lessons presented, this blog offers an opportunity to see what we look like, similar to a reflection in the mirror. But unlike a physical mirror, this blog serves to capture what you look like on the inside as well as the outside. In the words of St. Augustine, I hope when you pass yourself, you see the wonder in you! This blog will explore a wide array of reflections from current events to personal reflections through interviews, guest entries and contemplative pieces. Through each blog entry you read or view, I hope you are inspired, challenged and engaged in your own process of growing in character, integrity and reaching God’s given destiny for your life. Join me on the journey of discovery, awe, and wonder in who God created us to be! I have no doubt that this will be a worthwhile adventure!